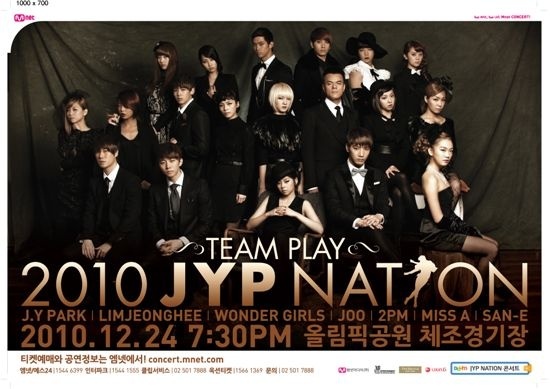 After Revealed “This Christmas” MV , JYP releases the Concert Poster for their first concert in Seoul named “TEAMPLAY”. All of JYP Artist will perform at this Concert: Park Jin Young, 2PM, 2AM, Wonder Girls, Lim Jeong Hee, Joo, San E,and miss A. This entry was posted on December 7, 2010 by redtofu. It was filed under Boy Band, Concert/Show, Girl Band, Images, News, Solo and was tagged with 2am, 2PM, Joo, JYP, JYPE, Miss A, San E, Wonder Girls.